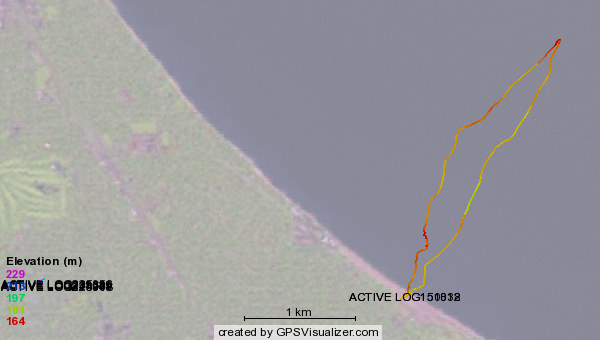 I'm messing with the GPS, here is a log of our sail on the H-18. Patty, Jeff and I rigged the Nacra in 20-30 kts winds Saturday morning. Unfortunately when we went to go put on our wetsuites, the wind grabbed the boat and sent in flying, breaking the port rudder casting. The good news is nobody got hurt, and the damage was minimal. After the nerves settled down (along with the wind) Roni took Jeff and I on the maiden voyage of his new prize, a Hobie-18 in near new condition.